Every night I go through this…. "What should we have for breakfast tomorrow?!" My family usually isn’t much help. They usually tell me, "Food!" or "Something yummy!" 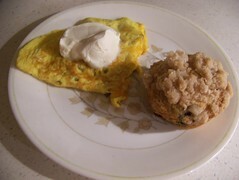 This morning I made stuffed omlets and blueberry struesel muffins with the help of my wonderful little assistant, Rebekah : ) She gets up with me every morning at 6 o’clock because she loves making breakfast! Cream sugar and butter together; add egg and vanilla. Mix well; set aside. In a separate bowl, combine flour, baking powder and salt; stir into creamed mixture alternately with milk. Fold in blueberries. Fill 12 greased muffin cups 2/3 full. Sprinkle tops with streusel mixture. Bake at 375 degrees for 20-25 min. Mix all together until course crumbs form. I like doing omlets this way, because we don’t always have a lot of eggs, and with 11 people, you can go through a lot in one meal! Beat the eggs together with a little water. Pour into a greased skillet and begin to cook on low/med. heat. Sprinkle with salt and pepper. 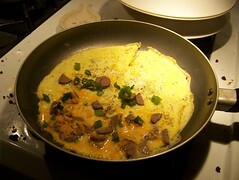 Sprinkle one half of the omlet with the meat, cheese, and greens. 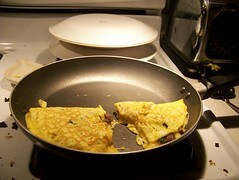 Cut omlet in half and fold over each side as shown. ← I’M GOING TO AUSTRALIA!!!! WHO’S COMING WITH ME??? Here I am wondering what to make for dinner and you're showing me a scrumptious breakfast! I don't mind breakfast for dinner though. Thanks for sharing your photos and recipes! Those muffins look good Jessica! We like to do stuffed omelets too with bacon bits or ham, and cheese in the middle. Hope people are feeling better over at your place! I hope you know who KD is, add a K to the end and then you'll hopefully know for sure :). I'm related to missladybug :p lol. Thank you for posting your recipes and pictures. It looks so lovely and yummy. I have only attempted to make omelets a few times, I will have to try them again. Have a beautiful wintery day! Yahoo!!!!!! [That's the interjection : )] Fireproof is out!!!! I absolutely love that movie! It's the best movie I've ever seen… bar none! Anyone who hasn't seen that movie, buy it and see it… you won't regret it! Hi, Cassia! I plan on replying to your email very soon, just to let you know… 🙂 I know it's been awhile – I've just been quite busy. I am sorry to hear that you are sick – how terrible! Last year we were all sick for over a month with some horrid, illusive, stomach-flu-pneumonia-fever, it was a mess, I think I have been grateful every day I have not been sick since. 🙂 I will write soon.